Puzzle size:20 x 29 in. 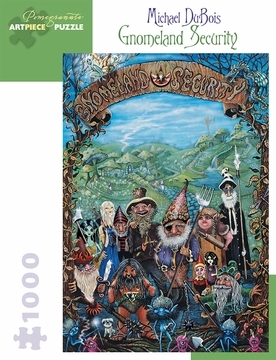 Residents of Gnomeland take pride in defending their homeland in Gnomeland Security. Using handmade weapons and tools, they protect against hostile invaders who dare threaten their peaceful existence. And they seem a formidable force: some of their weapons may be shiny, jagged, and sharp, but getting wonked on the head with a rolling pin looks sure to do the job, too. Artist Michael DuBois is known for his unique style alternately described as visionary, surrealistic, and psychedelic. He studied art at SUNY–New Paltz, spent two years in San Francisco designing posters for Bay Area rock bands, and in 1987 returned to New York, settling in Woodstock, where today he works in graphic design and fine painting.